Passive range of motion can be assessed and performed lying on the ground, while standing, or in the pool. Massage is most often a gentle manual release of muscle tension, although it may also incorporate some of the other manual skills already mentioned. It can be utilized in conjunction with post-surgery rehab or to maximize the benefits of chemotherapy. There is every reason to believe that massage therapy does the same for our beloved canine friends. 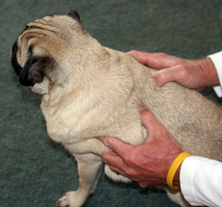 When massaging each dog every effort is made to convey a message of trust and an interest in helping that animal find balance and good health.